We have talked a lot about how moving can be stressful and difficult. It has been observed that a lot of people undergo some small injuries and sometimes major injuries while moving. We have compiled some moving safety tips to help you avoid hazards when moving. Let’s start with the basics. Having the right moving safety equipment will reduce the strain on your body and make your job easier. These tools are not expensive and most of them are reusable so you can keep them for future use. A pair of gloves will protect your hands from splinters and enhance your grip on slippery objects. Wear comfortable clothes to ease your movements. Avoid loose clothes which can get stuck between objects. Also, if you have long hair, it’s recommended to keep it above the shoulders. You can rent dollies or furniture sliders. These will make lifting and moving heavy and oversize objects and furniture easy. If you have small kids or pets, it’s recommended to keep them away when moving or find someone to take care of them. Small kids cannot help and they could easily get hurt or injure themselves. Pets also could get hurt or be a trip hazard when they decide to play with you when you are lifting big or heavy objects and you don’t see them. Don’t lift with your back, bending your knees and spreading your legs while lifting heavy objects will put the weight on your legs and arms. If you feel tension on your back, you are doing something wrong. Put heavier items on the bottom and lighter items on the top in the box. 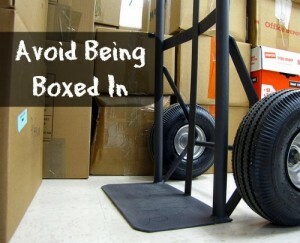 This will not only make it easier for you when lifting and moving the box, it will also protect you items in the box. Don’t mix fragile items. Avoid mixing fragile and breakable items with other items. This will also help in unpacking. Properly label boxes. You can label the boxes with their destination rooms and a little description of their content. This will help you or the movers know where to put the boxes and how to handle them. Don’t leave empty spaces in boxes. Leaving empty space in the boxes will allow items in the box to move which can damage them, break, or cut through the box. This can also leave the box unbalanced. You can avoid this by filling the gaps with packing paper, or clothes. An experienced moving company will help you move large and heavy objects. They will also give you tips and move your items safely to their destination. Click here for tips on how to choose the right moving company. This entry was posted in Stress Free Moving Tips and tagged Moving Safety, Moving Tips, Safe movers. Bookmark the permalink.